Holy smoke, the days are flying by much too fast. We have all been working away like crazy on many, many fronts, and things are moving along with them all: the engineering/tooling for Robotech® RPG Tactics™ Wave Two items, additional support for RRT on several fronts, several new book releases, conventions and new business opportunities. Yikes. Right now, we need to get a couple of books wrapped up and sent to the printer, so I’m going to keep this Update short and to the most immediate items of interest. This weekend is your last chance to subscribe to The Rifter® and get a FREE gift worth as much as $35.85 (practically the cost of the subscription). This year’s gift selections are the most unique and enticing ever, because I want YOU to discover the value and fun every issue of The Rifter® has to offer. 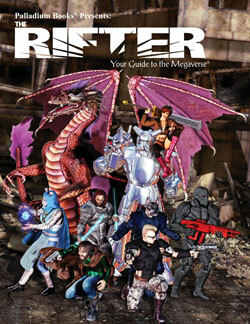 The Rifter® is an excellent gaming resource for players and G.M.s alike. Adventures, monsters, and villains for any given setting can all be easily adapted to other game settings. The Rifter® Super-Subscription Drive only happens once a year, and in addition to saving $16.00 off the retail price, you can get some cool free gifts, so take a look at it. 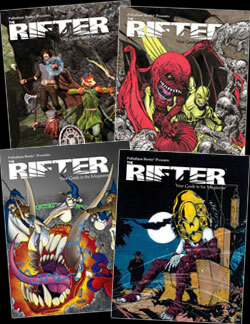 Please keep The Rifter® Super-Subscription Drive going strong. This offer ENDS at midnight, March 1, 2015. Since the “weekend” ends with March first, we have extended the offer to include Sunday, March 1. After midnight on Sunday, the subscription offer is over. Get yours while you still can. 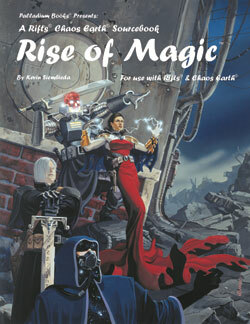 Chaos Earth® Rise of Magic™ arrived from the printer TODAY. Pre-orders have already started shipping out. 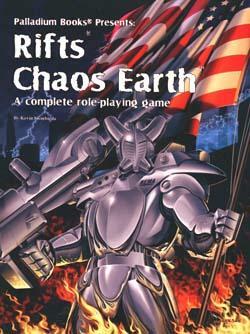 I forgot how cool Chaos Earth® Rise of Magic™ is with its different approach to magic, and the ways ordinary people caught in the Great Cataclysm discover, learn and use magic and ley lines. See how survivors deal with the sudden appearance of demons, monsters and magic. Magic that appears along the Blue Zones (ley lines) and magic that is suddenly being cast by ordinary people – children and teenagers in particular. The guy who wrote this book did a pretty good job. Oh wait, that was me. lol. Taking orders and shipping right now. 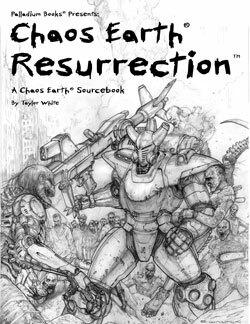 I spoke with artist Chuck Walton and he expects to have the finished Chaos Earth® Resurrection cover to me by Monday, then he’ll start on the interior artwork. I think Amy Ashbaugh will be contributing to this book too. 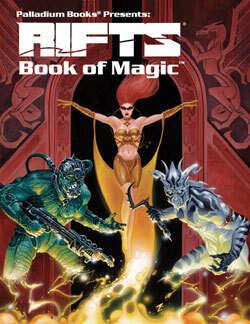 An April release, with Chaos Earth® First Responders by Jason Richards coming in the spring or summer. So close now, I can taste it. I think I have only two or three Bizantium manuscript files left. Wayne is editing away. Typesetting and layout will be starting any day now. Absolutely goes to the printer next week. Awesome book. Lost secrets, lost treasures, ancient gods, sea serpents, monsters, animals, political intrigue, updated stats and information on key places, the Great Ice Shelf and my new favorite villain, the Iceborn — you will love hating them. 192 pages coming your way next month. See the full description elsewhere in this Update. The Rifter® #69 is full of all kinds of crunchy goodness. And I mean full with material for Rifts®, Chaos Earth®, Heroes Unlimited™, After the Bomb®, G.M. tips and more. The book is in final production. All the artwork has been assigned and some of it is already finished and in our hands. See the full description elsewhere in this Update. Artist Chuck Walton tells me he expects to be done with this cover next week. And we expect to dive into production of The Rifter® #70 in short order for an end of April release. We need to make EVERYBODY aware of Robotech® RPG Tactics™, so please spread the word, and talk the game up, because while we’ve been working on getting Wave One shipped and Wave Two advanced into manufacturing, we have been developing plans for all kinds of future releases. Everything from game pieces to broaden the scope of battles (like tanks, trucks, the Comanchero Helicopter, other aircraft, etc.) 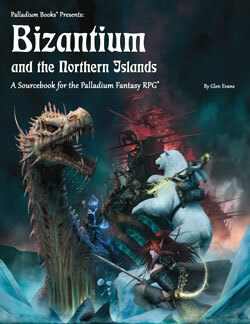 to scenario books and advanced rules and new battle-fronts. As you know, Robotech® RPG Tactics™ (RRT) – which starts with the Macross mecha and setting – is NOW AVAILABLE in stores across the USA and Canada (and soon in Europe and Australia). But we have big plans for all eras of Robotech® and ideas that have NEVER been done! (And you are going to love.) If you can’t find Robotech® RPG Tactics™ on the store shelf, make sure the manager and/or owner of the store knows you want the product and that he can get it right now from his distributor! 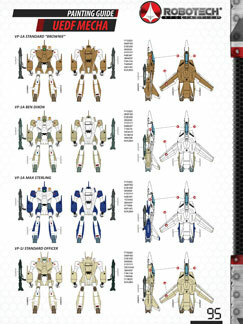 Robotech® fans, the RRT rules capture the very essence, speed and combat action of the Macross TV series. Collectors may want this gorgeous game just to have in their collections, because it is beautiful and contains a wealth of art and images never before offered. Take a look and spread the word. Oh, and for those of you who would like to see the rules first, you can purchase the full color Robotech® RPG Tactics™ Rulebook directly from Palladium Books. We also intend to make the rules available online. Join the thousands of people who are already building, painting and playing right now. 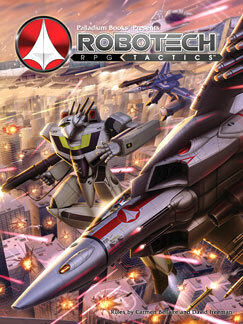 Robotech® RPG Tactics™ games and tournaments are already starting to pop up at conventions and more will be coming. 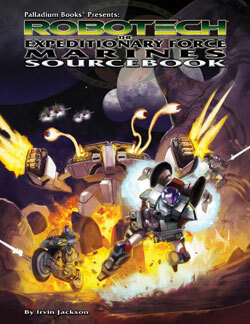 You can also see the FREE Robotech® RPG Tactics™ offerings and support for Robotech® RPG Tactics™ on DriveThruRPG.com, at the Robotech Tactics International "Unofficial" Facebook page, and with much more support for the game line coming to the Palladium Books website and all these places. See the DriveThruRPG update below. The Robotech® RPG Tactics™ rewards to our backers in Europe have arrived in port and should reach our UK shipper in about 10 days. It still has to clear Customs and get shipped to the folks mailing out product across Europe. There is still time for some last minute address corrections, if necessary, so PLEASE MAKE SURE WE HAVE YOUR CURRENT and CORRECT MAILING ADDRESS. The Robotech® RPG Tactics™ rewards to our backers in Australia should be arriving in port in about two weeks. Our Australian shipper has requested we get them all current addresses by Monday, March 2 – so they can start prepping for the big mailing as soon as product reaches their doorstep. WE want that too. As do you. If you have MOVED since the Kickstarter was funded, PLEASE MAKE SURE Palladium Books has your CURRENT address as soon as possible. That means NOW (this weekend). To make sure we see it, make the subject “Address Change.” TIME IS OF THE ESSENCE!!! Do not risk your reward going to the wrong address because YOU failed to update your address. If your rewards go to the wrong address they might be lost and unreplaceable. Interviewer Mike Dodd let us know he could not get the interview up last weekend, but it will appear this Saturday, February 28, 2015. It was very fun to do, and I think many of you will enjoy it, so check it out. Our conversation touched on the gaming industry in the 1980s and 1990s, TMNT®, Robotech®, Rifts® and getting started in the business. Like I said last week, I’m pulling out all the stops for the Palladium Open House. There will be more panel talks, lots of games (many run by Palladium creators), there will be one-of-a-kind art items, original artwork (including some from the original Robotech® RPG and Rifts®), and I’m continuing to dig through my archives for offerings of rare limited editions, out of print Robotech® and Teenage Mutant Ninja Turtles® books – some signed by the late, great Erick Wujcik – truly unique collectibles that you seldom (if ever) see, new products we are test marketing, a Rifts® 25th Anniversary party, live auction and more! Meet 30+ Palladium Creators, get autographs and enjoy gaming galore and lots of fun and memories to make. I’m hoping for a record turn out this Open House. Come on down even if it’s for one day to meet and get autographs from 30+ awesome artists, writers and Palladium madmen (and women). It is going to be epic! And hopefully not the last, but as we finalize our plans for the 2015 POH we are more and more convinced this may really be the last Open House. So if you can attend – especially if you live in the area – join us for a party-like gaming extravaganza. Please order your POH tickets as soon as possible because we need to know how many games and events it will take to keep all of you gaming and busy all the time! Tell your local store if they are having problems getting Palladium product, to call us. We continue to hear from customers and store owners that they cannot get Palladium product from their distributor. That’s crazy because Palladium Books has 98% of its game titles in stock, in its warehouse, at all times! This is true of Robotech® RPG Tactics™, Rifts®, Dead Reign® and ALL of our games. If a distributor tells your local store we are out of stock, it’s baloney! Have your store contact Palladium Books (734-721-2903) and we’ll help them get our products one way or another. We’re going to be putting together a directory of “Fan Favorite Stores” that carry Palladium products. Stores that you, our fan base, know, love and who carry Palladium products. We want our customers to be able to find our games wherever they live. These must be stores that carry Palladium Books products (even if it’s a small selection or new releases) and willing to order more when customers request them. Final words this update . . .
Hey, just because we don’t mention a specific product, product line or project that you are looking forward to, does NOT mean something bad has happened or it isn’t coming out. It just means we were focusing and talking about different products and happenings in this particular Update. Please do not assume the worst. If I tried to cover everything cooking on every front, these Updates would be three times larger and I’d have to spend an entire day writing one instead of working on getting product out. Keep the faith, stay positive, and have a great weekend. Books are coming!